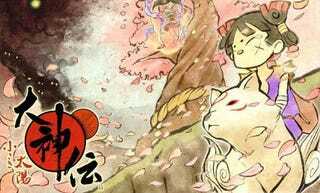 Here are some new screens for Capcom's Okamiden, on the Nintendo DS. They're looking a little rough, but then, most screens on the DS look a little rough. It looks much better in motion. Hey, A Real Okamiden Trailer! I was initially sceptical of the game being on DS, but you know, that looks good.